Germany's new stealth fighter (concept drawing). Germany has advanced the program to build its own sixth generation stealth jet fighter from concept to the initial working stage. The leap from building fourth generation fighters to sixth generation fighters will be a huge one for Germany, which has not built a jet fighter on its own since it produced the twin-engine Messerschmitt Me 262, the world's first jet fighter, in World War II. The Me 262 first flew in 1941; entered combat service with the Luftwaffe in 1944 and was retired at the end of the war. The Me 262 shot down over 500 Allied aircraft, mostly American. 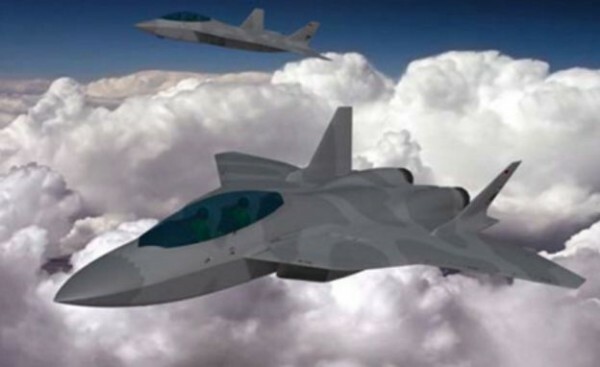 Germany and Airbus Defense and Space said they're in the initial stages of a new program to build the Luftwaffe's sixth generation fighter, which has been named the Future Combat Air System (FCAS). FCAS will replace the Luftwaffe's aging fleet of Panavia Tornado fighter bombers and complement the Luftwaffe's Eurofighter Typhoon air superiority fighters. FCAS will likely be a twin-engine, twin-tail aircraft piloted by two crewmen. The Bundeswehr (federal German armed forces) plans for FCAS to be operational between 2030 to 2040. FCAS will be a "system of systems" that combines manned and unmanned aircraft into one operational unit. "In principle, it could be a system of systems -- either a manned and unmanned combination," said Alberto Gutierrez, head of the Eurofighter program. "(We have determined that unmanned combat air vehicles) UCAVs will not be at technology state ready by 2030-40 to support Eurofighters. It could be optionally manned, with two crew -- one for command and control (and one pilot)." A second crewmember is key for the FCAS concept of operations, which will have the fighter operate in a wider battle network, potentially as a command and control asset or UCAV/UAV mission commander. FCAS will also operate as a "networked node" controlling "missile truck UCAVs" and drone swarms in contested airspace. The concept for FCAS first popped up in mid-2016. It was first called the Next Generation Weapon System (NGWS) intended to replace the Tornado. In late 2016, Airbus Defense and Space unveiled its concept FCAS to meet the Luftwaffe's requirement for its own stealth fighter.